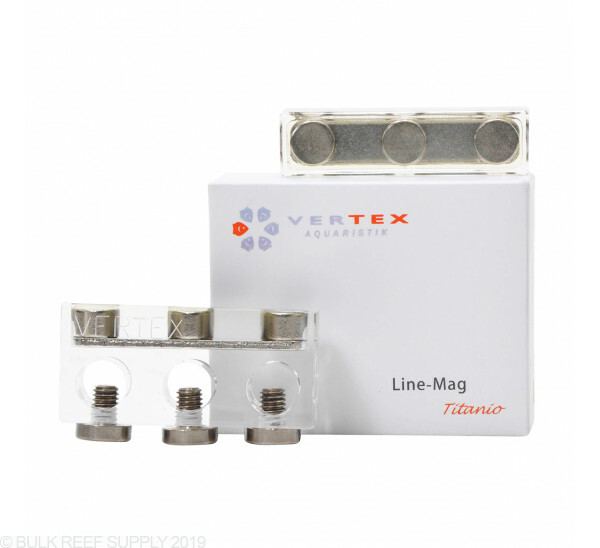 Hold your dosing tubes in place with the stylish Vertex magnetic tube holder. Won’t stay in place on 1/4” glass, screws too short to secure tubes. This line holder looks great....just wish had stronger magnets.....easily comes off....maybe they will think of replacing the magnets with stronger ones. In short, this magnetic tube holder isn't strong enough to be trusted to stay put. The magnets simply aren't going to hold unless its placed on a very thin piece of glass or acrylic. It proved to be useless to attach to my 3/4" glass and marginal at best on my 1/8" thick acrylic sump. The tubes themselves tended to pull the holder around and it was impossible to keep in the correct orientation. The slightest bump would also pull it right out of my sump. Aside from the under-powered magnets, the build quality is very good. The acrylic is machined well with nice and tight threads for the high quality titanium screws. 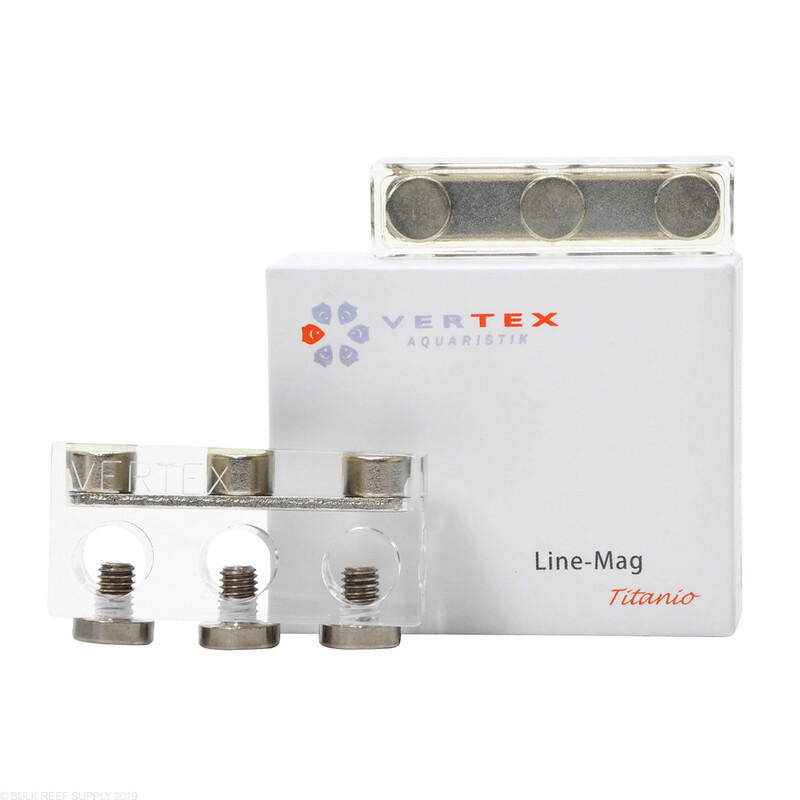 I've experienced some issues with loose threads on some products, this is not the case with the Vertex Line-Mag holder. I used this for less than a week before I replaced with something else. Initially I purchased this because I wanted to avoid drilling my sump. I ultimately did so anyways. Save yourself the time and cost and do it right the first time. 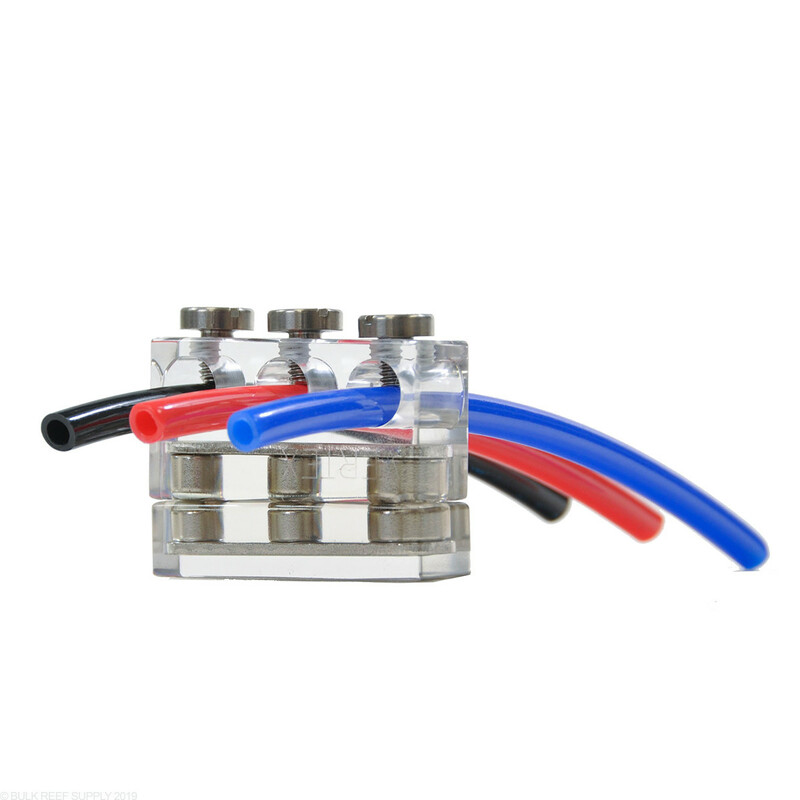 I have this on 10 mm Glass and the Magnets are incredibly strong, I get worried when removing the back that if I don't slide the backing to the magnet when putting back on, the sheer force of the backing connecting to the holder could potentially break the glass. I use the Holder for a pH, Conductivity, & Temp probe for the Apex. The Temp probe will fit if you thread the wire in 1st. The product is incredibly well crafted, cleans up easily, and practically indestructible. The only thing I really didn't care for was the price, but then again as long as this probe holder will last you will eventually forget about the money spent! Whoever chose the magnets for this should be shot. It does not hold onto my 8 mm glass. It literally does nothing and is useful for nothing. I would use it as a paper weight, but it probably wouldn't hold the paper, either. I don't know how this product got four stars. The product is beautiful to look at, but, the function is poor. My sump has 1/4" thick walls, and the magnet barely holds. Any tension from the dosing tube and it will dislodge. I use a strong dosing pump -- the LiterMeter III, and, the vibration in the line that it produces (it can pump up to heights of 60 feet so it is high pressure) can pull the holder from the wall of the sump. It has three nice titanium screws to hold the lines in place. 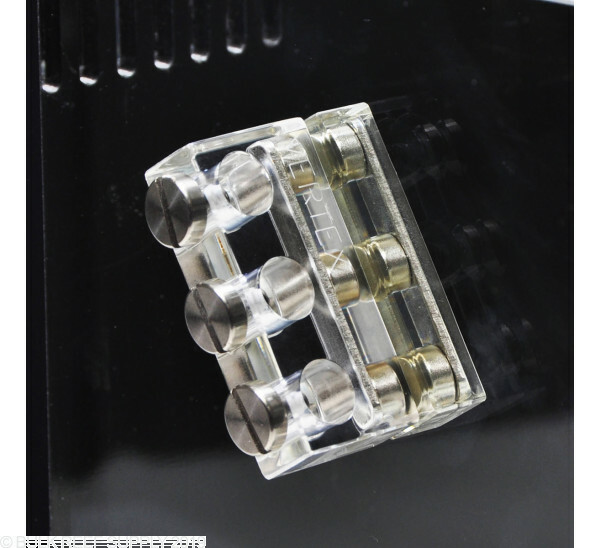 However, the acrylic block on mine was poorly threaded on the center of the three holes, and, it is very hard to unscrew/screw. As another reviewer indicated, the titanium screws are too short for soft airline tubing. It seems only the opaque semi-rigid tubing can be held secure. If the titantium screws were only an 1/8 or 1/16 of inch longer there would be no complaints. 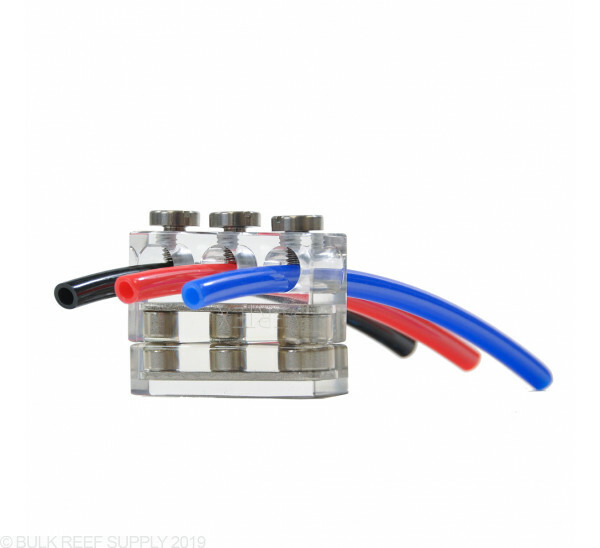 This holder works very well, and has a very small footprint; it blends in with the glass and holds tubes in place securely. You could definitely find something cheaper, but it probably won't look as good. I use it to hold a Tunze ATO tube line, the previous line holder created a lot of noise because of the way the tube was directed, and now with the Vertex Line-Mag Holder it's completely silent when water is being added to the DT. Does this do a better job than other holders? Not really. It's Vertex so you know you'll get quality. Good magnets and titanium screws. End of the day it may cost a bit more but will do the job, hold up well and look great. Consider the thickness of your intended probe and pick the appropriate size holder. Good quality well made line holder. Magnets could be stronger, but overall very nice.